Hiring a web designer for your small business website? Finding the right one is no small task. Having worked in tandem with dozens of web designers to launch new sites, here is our wisdom to share on eight questions to ask a web designer you’re considering hiring. May I contact your references? Due diligence and checking references will pay off — we recommend a minimum of three when hiring a web designer. Often, references confirm what else you’ve learned – positive or negative – about the web designer in question. Remember that a designer will send you to people they’ve had a positive working relationship with, so if they can’t find three people willing to speak positively overall about their work you should consider looking elsewhere. May I see a portfolio of recent work? Review at least five websites they have recently designed (examples of recent work can often be found on their website before you even reach out). What themes do you notice? Do they use the same template? Are they dynamic? Are they easy to use? You can expect your website will look and perform similarly. What CMS do you work in primarily? 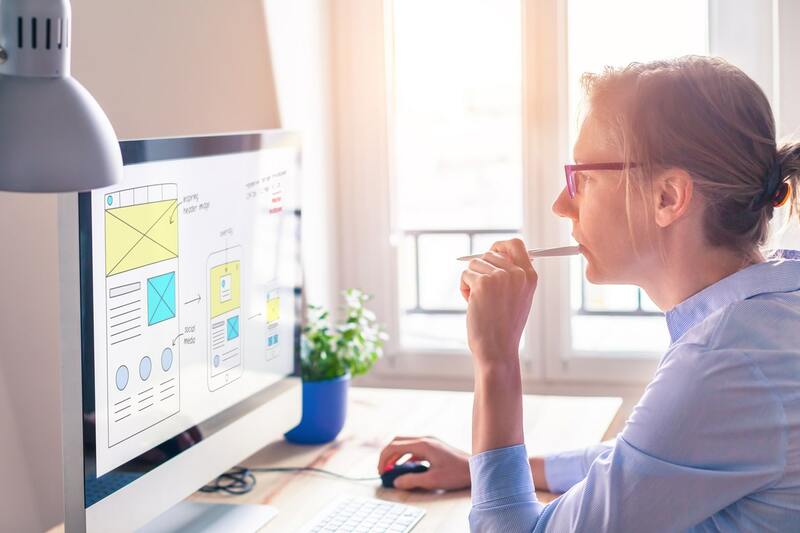 Most designers will have a primary “content management system” they prefer, and they should be able to explain why they are recommending a particular CMS for your business. Examples of a popular CMS are WordPress, Wix, Squarespace, Drupal, or Joomla. Some designers use a custom CMS, which means they have built it themselves. Micro businesses that will always remain 1 or 2 person shops may benefit from using Wix or Squarespace, which are limited platforms that may be easier to manage than more a complex CMS that offers greater functionality and flexibility. On the other end of the spectrum, Drupal is becoming popular among educational institutions like colleges and universities. WordPress is our personal favorite CMS because it has nearly unlimited functionality that allows the site to grow as the business does, it is free, and there are millions of programmers familiar with the platform so you’ll never have trouble finding someone to help you. For more on which CMS is best for you, we recommend this article on the best website platforms for small businesses. This may be one of the most important steps to hiring a web designer because your CMS will stay with you as long as you keep that website, which will hopefully be several years. What is your approach to web design? How does the designer balance functionality with the user experience? How do they incorporate Call to Actions (CTAs) in their web design? Where do you source photos? If you have recent professional photography, skip this one! Otherwise, make a plan for where you will get top quality photos from. Please don’t say your cousin! Many designers have access to quality stock images, but ensure you agree with their approach to this element before signing a contract. What are your monthly maintenance plans? Even if you intend to maintain your website yourself, you will very likely need professional assistance from time to time. It’s good to know the rates up front – and if a maintenance package is required as part of your purchase. What is your price range? Check for additional fees for e-commerce, backend employee logins, and other functionality you may need. So-called “content” websites are generally cheaper to build than websites that need specialized functionality, such as the ability to log in to the website, accept payment for goods or services, upload or download content, etc. Can you recommend a good copywriter? Hey, that’s us! Before you sign a contract with a web designer, plan to organize and re-write (if needed) every single page that will be part of your new website. You’ll end up with a stronger website if you devote resources to polishing your content (text and images) before you ask a designer to get to work. Can you imaging designing a page before you know whether it will contain 50 or 500 words of text? What else do you look for when hiring a web designer?